This blog post was originally published on the RSA website on the 14th December 2015, you can link to it here. At the RSA we call our current approach ‘the power to create’ and our three-year strategy has now crystallised around this; as a lawyer who is employed to support the governance of the RSA this raises an interesting question. Creative lawyers and for that matter creative accountants and other individuals paid to measure risk do not have much credibility in being labelled creative. In my former career as a fraud lawyer the term creative would often be used as a mark of derision in cross-examination or closing speeches before a jury or judge. Working at the heart of such a creative organisation as the RSA has caused me to begin to appreciate how nuanced the question of risk can be. For the RSA like many other organisations sitting at the heart of the information revolution we are currently going through there is a serious risk in not being creative enough. While huge multi-national organisations can grow in a few years to be behemoths of our age large behemoths can disappear in a matter of year or two. Risk is usually measured based on two factors, the likelihood of a decision having a good outcome and the commitment of resources that it will take. 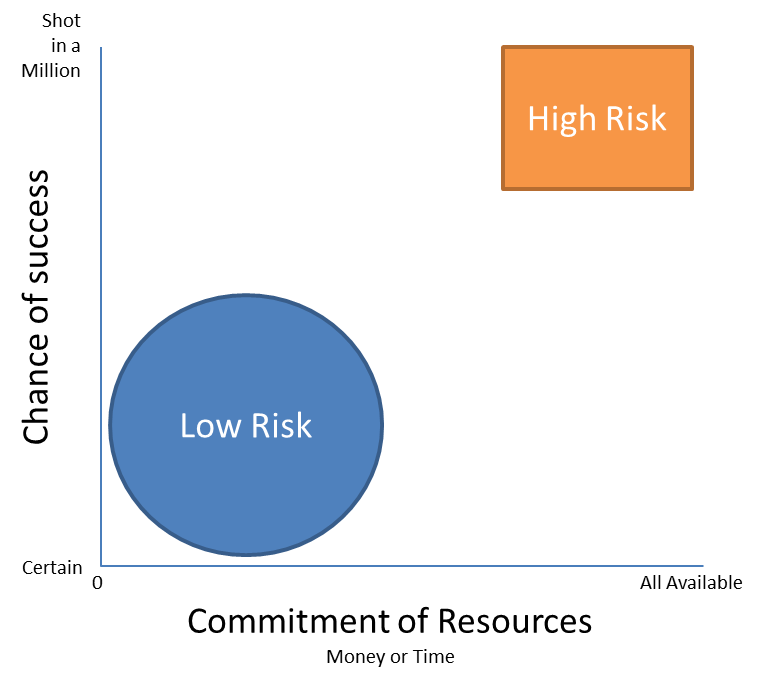 Traditionally organisations, especially ones which have been established for some time have avoided making high risk decisions and tried to make sure that the decisions they have made have predominantly fallen within the low risk category. In fact the role of professionals like myself has been to help Boards and Management Teams avoid those categories in the High Risk territory while carefully managing risk so they fall in the low risk areas; giving advice accordingly. The difficulty now though is that this paradigm no longer works as technology changes at such a fast rate and correspondingly the rate of development itself has dramatically increased in our increasingly connected world. Two examples of cautious companies that have made safe decisions and found themselves in difficulties are Blackberry in the mobile market which ten years ago was the dominant player and Kodak with the advancement of digital photography. The hard lesson at the core of both is they had the research and innovation to continue to be dominant players (Blackberry still leads in terms of security, Kodak was a pioneer of digital imaging) but failed to back those discoveries with risky decisions preferring to maintain the low risk option of continuing their current business models. Organisations learn to be willing to make paradigm jumps and by extension a Board and its advisors must learn to recognise that a series of low risk decisions may ultimately bring a premature end an organisation just as much as one wrong risky one. In some cases this may even require reframing governing documents or an organisation to help put it in a position to be able to make a paradigm jump when required. Boards must learn to be creative; and set up the processes to ensure they can be.When Google recently carried out a stock split recently one of the most interesting aspects was the careful structure the founders Larry Page and Sergey Brin used to ensure they still retained strong control over the company. They see shareholders control as a risk to be managed because inevitably shareholders have a tendency to limit the ability of Google to continue to be creative choosing instead to push for more short term return on investment. Boards must be skilled in creativity. In long established companies, the most Directors and Non-Trustees tend to be older or semi-retired; this needs to be identified as a risk. While experience is important the danger is that an older generation do not instinctively understand how core some of the changes are that society is undergoing. Famously I remember talking to a Sales Director ten years ago about the internet which he likened to a craze which would run out of steam and that any investment in it would be throwing away money. It may be the right decision not to make investment but that needs to be decided with some understanding of what is happening. Learn that it is fine to fail. Finally organisations need to recognise that failure and making risky decisions is actually something we should embrace and manage. A company will often see research and development and taking those products forward as different decisions; in fact perhaps they should learn they are two sides of the same coin. Ten products invented in the lab and taken to market that result in one successful product that takes off may be an acceptable rate of return. The problem is that most Boards will perceive nine failures and one success as unsuccessful management where maybe it should simply be seen as the price of investment in the tenth successful project which may not have come about if it were not for the preceding nine unsuccessful ones. It is of course very easy to articulate these challenges, the challenge for me and others whether as non-executive directors, trustees, lawyers, accountants or other advisors is to think more creatively about the advice we give and be clear that sometimes risky decisions are the right ones.